Approaching on foot we jumped a monster buck bedded in the beans not 50 steps ahead of us. Early in September, Kevin and I explored the area that I would be hunting. As we drove along the winding, sparsely inhabited backcountry roads of Trenton, Missouri, Kevin showed me several farms that he has rights to hunt. It was then that I discovered exactly why this area was so conducive to producing trophy bucks. Located in the beautiful Green Hills region of north Missouri, the property is a natural, game-rich wonderland that supports high concentrations of deer and turkey. The immediate geography mainly consists of flat, tillable soil and rolling hills with narrow fingers of broken timber that filter into vast crop fields and secluded woodlots, creating natural bottlenecks and funnels. At a glance, it appears as if one crop field seemingly melts into another for as far as the eye can see with only a few small wooded areas and hedgerows separating each food plot. This type of terrain lends itself well to ambushing deer with archery equipment. The lush ground offers everything a big whitetail could ever want and provides the deer with all of the nutritional elements that are required to produce trophy-sized racks. River and creek bottoms, upland hardwoods and abundant farmland are all present in this area. And, with little to no bowhunting pressure, as well as access to over 5,000 acres of prime habitat, the likelihood of taking home a Pope and Young buck is well within reach. Things were becoming increasingly interesting by the second. The further we drove, the more I noticed that a savvy bowhunter could exploit the natural features of the landscape to one’s advantage. It’s no secret that close range shots at good deer can be had by locating ambush sites in spots that force deer to move through naturally occurring pinch points. With that in mind, I was certain that this area would provide ample opportunities for such tactics. I tried to hide it, but a sly smile crept over my face as I began to daydream about the possibilities that lie ahead. However, due to the complexities associated with conflicting work schedules, Kevin and I were only able to spend a few hours together, which abruptly ended my near-slobbering, hypnotic stupor for the time being. Although I was extremely anxious to see more of what Honey Creek had to offer, I would have to wait a few weeks before making a return visit. But before I left, Kevin showed me a picture of a deer he captured on a trail monitoring device. The photo was of a huge 10-pointer with tremendous mass that we estimated would stretch the Pope and Young measuring tape to well over 160 inches. Talking about whetting your appetite! This time I was drowning! As the weeks slowly passed I kept in close contact with Kevin by telephone and through E mails. Each “visit” was better than the last. 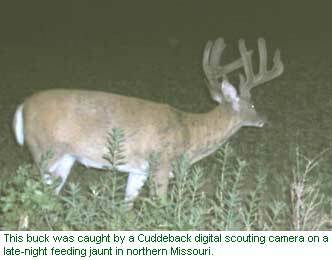 In one telephone conversation he said his Cuddeback Digital trail camera had captured 128 images in one of the areas that I’d be hunting, and 106 of them were of deer! Several of the pictures revealed shooter bucks. One particular deer had a clean, typically symmetrical 8-point frame that would score in the 140s. Yet another set of photos exposed two more bucks in the 140-class range. In case you’re not keeping score at home, that makes four different bucks whose racks would easily gross an average score of 145 Pope and Young points, if not more! A few weeks later I was back, and this time both Kevin and I had time to do some scouting. He showed me some more of his property, and things got better and better as the day went on. We drove to a huge soybean field and parked the truck about 100 yards off the dirt road alongside the lush meadow. Approaching on foot we jumped a monster buck bedded in the beans not 50 steps ahead of us. The deer’s antlers were massive with heavy, dark-colored main beams that swept around both sides of his head. The wide rack appeared to carry ten tall tines that jutted towards the sky in dagger-like fashion. His headgear also sported a few sticker points to add even more character. He was an awesome buck in every sense of the word. As he ran away from us, we both stood there in complete and utter amazement. Why he chose to bed in that particular spot is anybody’s guess. It just goes to show that big bucks can hide anywhere at anytime. After regaining our composure we continued on by taking an alternate route to avoid spooking the big buck any further. Kevin then showed me the exact spot where the 160-class 10-pointer was photographed. I liked the location so I made plans to return with a Gorilla hang-on stand. I would later place the stand high in a tree that overlooked the corner of two intersecting hedgerows on the northeastern edge of the bean field. We then made our way back to the truck to check out a permanent stand that Kevin wanted me to see. Secured to a huge oak tree, this stand is on the opposite end of the property and adjacent to a small pond where deer routinely come to water. It’s also within 100 yards of where we jumped the huge buck that I mentioned earlier. Situated in the middle of a narrow strip of timber that splits the western edge of the bean field in half, the stand takes advantage of a natural travel corridor that the deer use to visit the pond after getting their fill of beans. Climbing to the top of the platform and taking in the view, I liked what I was seeing. With no need to bring in a portable stand we moved on. After a long, hot day of baking in the mid-afternoon sun and performing my finest interpretation of Chigger bait, it was time to head home. With two stands already in place and plans to return the next weekend to look over more of Kevin’s area, things were starting to come together. Going back to work for a week would be difficult, but I would have to tough it out. 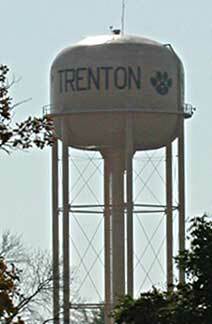 Following an excruciatingly long week of work, I was back in Trenton, but this time I wasn’t alone. My wife, Michelle, decided to tag along and would be joining me on my scouting and stand hanging forays. It was the last weekend of September, and the temperatures were in the middle-to-high 80s, making for miserable scouting conditions. The black flies and mosquitoes were out in full force due to the warm weather conditions, but the sign we were finding was more than enough to ignore the assault of a few biting bugs. The resident deer herd was beginning their scraping activity early in this part of the country. Scrapes and actual scrape lines were starting to turn up in earnest, which seemed very unusual given the fact that it was only the first week in October. But I wasn’t about to quibble over details. The sign was there, and I would try to use it to my advantage. Michelle and I put up a total of four tree stands in varying locations that all held promise. One stand was set high in a mature oak tree overlooking a group of scrapes that ran along a fence line for 200 yards. The fence line separated an overgrown field to the west and the woodlot that held my stand to the east. We placed another stand in a tree on the bank of a grassy glade. A winding creek bottom to the south and a soybean field to the north flanked the small clearing. It was a good-looking spot. The third stand was set on the southeastern, outside edge of a strip of timber that ran down the middle of a horseshoe-shaped hayfield. The field was dotted with scrapes from one end to the other. The last stand was set at the intersection of two hedgerows on the north end of the first bean field that I initially scouted with Kevin. With all of my stands in place, Michelle and I decided to glass a huge bean field for bucks until sunset. Although it turned out to be a gorgeous evening, it was a night for seeing non-antlered specimens. Tired and hungry, we drove back to town, showered and ate our late supper at a local pizza shop before hitting the sack. Twenty-one days later I would return with my bow to start hunting. I couldn’t wait! After suffering through another long stint of work, I was finally able to swipe my timecard for the last time before embarking on my first Missouri whitetail adventure. Only time would tell if my pre-season preparations were enough to earn myself a chance at harvesting a mature animal. I arrived in Trenton on a Friday afternoon and met with Carolyn Brown, owner of The Hyde Mansion, a historical Bed and Breakfast that I would be calling home for the next 6 days. After checking in and unpacking my gear, I called Kevin, and he and I discussed my game plan. I decided to hunt the first farm where we jumped the big buck from his daytime bed in the beans. This is the same farm where the 160-class, 10-pointer was photographed. With my strategy in place, it was time to relax before heading off to bed. I unpacked the rest of my gear and watched the weather report before calling it a night. The forecast called for a fairly stable weather pattern throughout the week. Things were looking good.